Wear clothing, boots and gear that do not retain soil or plant material. Avoid brushed cotton, netting, Velcro and knits. Consider dedicating a pair of shoes or boots for use only in infested sites. Before leaving the park, clean your shoes and your pet’s paws. Check your dog for seeds and soil before leaving the park. Use a grooming brush to remove any plant material before getting into your vehicle. Check your dog’s paw pads, between their toes, in their ears and nose for any seeds. If seeds are lodged in their nose or eyes, see your vet. The aim of the herbicide ban is to eliminate non-essential uses of herbicides on city-owned land while recognizing there are circumstances where herbicide use is required. Learn more about the herbicide ban at edmonton.ca/herbicide. The City employs a variety of tools to keep our green spaces in shape. We mow the grass regularly and use several different techniques to manage weeds, including mowing and hand pulling. We are always looking for new ways to control weeds and support healthy turf growth, including heat and steam treatments, biological controls and animals, like goats. Promoting healthy turf can also help minimize weed growth. The City of Edmonton supports turf growth by aerating, top-dressing, fertilizing and overseeding grass. Find information about all the weeds regulated in Alberta and how to identify them. The City's approach to controlling dandelions and other broad leaf weeds. What you can do to control a weed problem on your property. 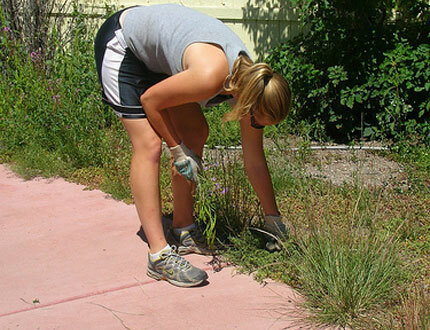 Find a weed pulling event in a community near you.